There’s no question that the Internet has become a valuable source of health information over the past few years. Sites like WebMD, Yahoo! Health, Google Health, and others attract over 60 million visitors each month. Now A.D.A.M. Inc., another online health information provider, has created an application that allows iPhone users to quickly and easily access data from their Health Encyclopedia using the iPhone’s touchscreen. 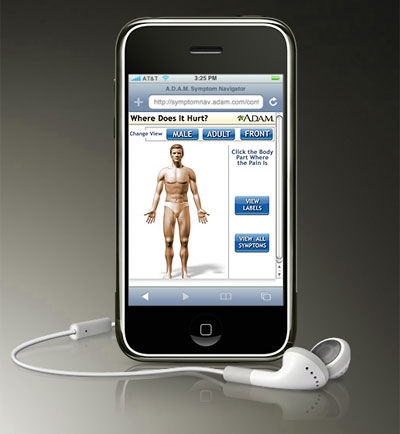 ADAM’s Symptom Navigator for the iPhone presents an image of the human body and prompts the visitor to tap the affected area of the body to receive a list of possible symptoms. For example, touching the abdominal area of the body image generates a menu of relevant symptoms including (but not limited to) pain, increased or decreased appetite, indigestion, nausea, and heartburn. Selecting a symptom guides the visitor through possible causes, options for home care, and whether a doctor should be consulted. Visitors can choose from a male or female body image—as well as a front or back view—to ensure that gender-specific symptoms, as well as those peculiar to any area of the body, can be addressed by the software. I’m not a hypochondriac, but l played one for the purposes of this interview. In my tests using various made-up symptoms like stomach cramps, swollen glands, and headache, I found the Symptom Navigator to be extremely simple to use, and very helpful in guiding me toward possible causes and treatments. The information provided is thorough without being overwhelming, and the interface is constructed in such a manner that makes it nearly effortless to explore the myriad of symptoms that are often associated with a particular region of the body. I did notice, however, that the menu of symptoms sometimes included entries not specific to the area of the body I was focused on. Tapping the knee of the body image, for example, presented me with “hip pain” as one of the symptoms, while the Navigator suggested “shoulder pain” as a possible symptom when I tapped on the hand. Apparently the software groups the shoulders, arms and hands together as one collection of symptoms; the same approach is taken for the hips, legs and feet. I also found it curious that you can’t tap on the feet of either the male or female body image, you need to tap in the ankle area or higher to access the symptoms menu for the lower extremities. Another concern I had with the presentation of symptoms was that in numerous cases, the menus contained entries more akin to diagnoses as opposed to symptoms; for example, “gingivitis” rather than “bleeding or painful gums,” or “runner’s knee” as opposed to “knee pain” or “pain at front of knee.” If I already knew I had gingivitis, I don’t think I would find the Symptom Navigator nearly as useful as it would be were I to indicate a symptom like “facial swelling,” and discover that I could be suffering from angioedema, perhaps due to a particular antibiotic I had just started taking. For a real-world test, I fed the Navigator the real symptoms of an acquaintance who was recently diagnosed with Raynaud’s phenomenon. Clicking on the hand of the female body image led me to choose “numbness and tingling,” one of the primary indicators of Raynaud’s. Unfortunately the Navigator not only omitted any reference to Raynaud’s, but it did not even mention “fingers” once in the entire “numbness and tingling” subsection. “Carpal tunnel” was offered as a possible cause, but an exploration of that diagnosis made no mention of Raynaud’s either. By contrast, a simple Google search for “numbness and tingling of the fingers” led me to sites such as wrongdiagnosis.com, medicinenet.com and even an ad for therapygloves.com (which unabashedly proclaimed “You’ve got Raynaud’s phenomenon” right at the top of the page), all of which feature Raynaud’s prominently as a possible cause. So I was a bit disappointed that the first “real” symptoms I approached the Navigator with yielded a somewhat less than complete list of diagnoses. My overall assessment is that the folks at A.D.A.M. have done a wonderful job in creating the Navigator’s interface and in providing an extremely friendly medical resource for the iPhone that can provide helpful info in very short order. I do think that the content needs to be somewhat more comprehensive, and the symptoms menus need to focus more on presenting actual symptoms and less on diagnoses. Since this program is already so helpful and simple to use, I can only hope that an iPhone 2.0 version is already under development, which could contain more information and diagnoses, while also allowing offline access to the data in the event an emergency arises and your iPhone’s got zero bars. So I’m looking forward to that, for the next time I feel a strange ache in my lower back and I’m nowhere near my doctor’s office—or a computer. A.D.A.M., A.D.A.M. 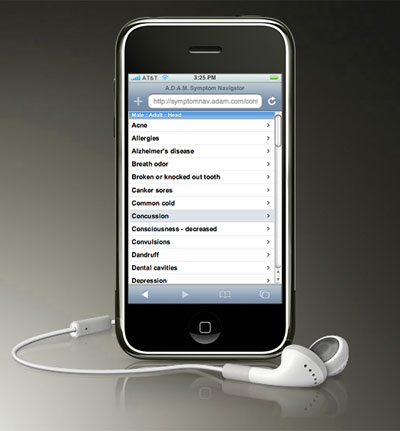 Symptom Navigator for the iPhone, Inc.